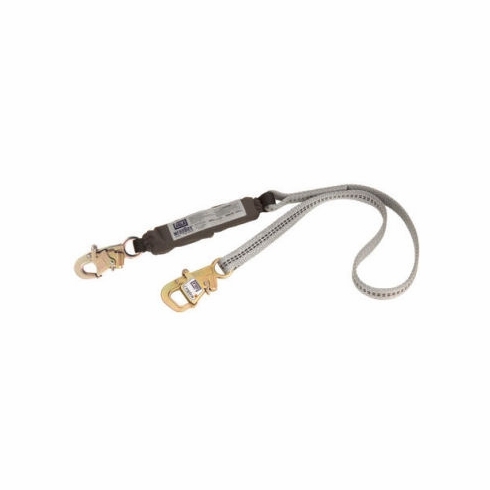 DBI/SALA®, 6' WrapBax2™, Tie-Back Shock Absorbing LanyardDBI/SALA® 6' WrapBax2™ Tie-Back Shock Absorbing Lanyard. Item # 1241906. The new WrapBax™2 hook offers a unique look to easily differentiate from standard hooks and provides 5,000 lbs. strength – even on the gate. Traditional hook designs are not intended for tying back, however, many workers mistakenly use their standard hooks to tie-back. Should the worker fall with a standard hook tied back, the forces may inadvertently end up on the gate which is not intended for load-bearing, causing it to fail open and injure the worker. The new WrapBax™2 hook offers a unique look to easily differentiate from standard hooks and provides 5,000 lbs. strength – even on the gate. WrapBax™2 provides the worker with a tool they will use safely, eliminating the need for a separate anchorage connector, reducing inventory and cost, simplifying inspections, training and improving compliance. - The WrapBax™2 is specifically designed for tie-back use – eliminates the need for a separate anchorage connector, reduces inventory & cost, simplifies inspections & worker training & improves compliance.